Calf-high leather boot with silver-rimmed rings. Photos by Yours Truly. NICOLA Sexton saw a problem and she sought a solution. 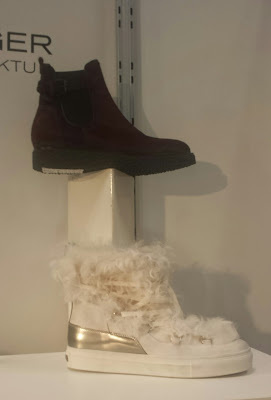 The result of her troubleshooting is Nicola Sexton, an eponymous line of Italian-made footwear. To ensure that her product could figuratively hold its head high in the presence of the formidable Italians, the former real estate executive took herself off to that land. Soon, she pressed into service a manufacturer that could deliver a product such as a fetching little pump. Of course, this is not to suggest that the Nicola Sexton pump is a doppelganger; the perfectly, proper and comfortable-seeming affair is far from it. In the UK, such a one is called a “court” shoe, the kind that royals, nobles and others of that ilk might don to visit the queen. The queen, herself, wears such footwear, does she not? From the Fall-Winter 2015 Nicola Sexton collection, patent leather pumps with buckle in stone and black. But one digresses. 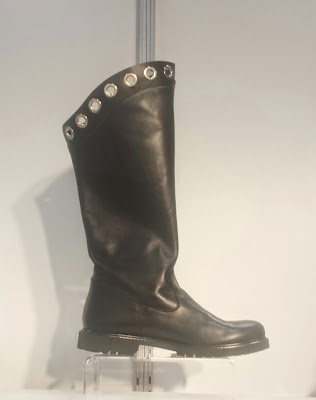 For Fall-Winter 2015, Nicola Sexton offers footwear – boots, booties, ballet shoes – for just about every occasion in colors of the season, anchored by black, of course. Here is a collection that is much like its creator – understated, conservative and elegant. Some bare accents such as buckles, do-dads and sliver-ringed cutouts. A few boots are lined and/or rimmed by shearling. At Nicola Sexton, the mandate is not to reinvent the wheel. Instead, it is to ensure that it is always well-oiled. And so it is. 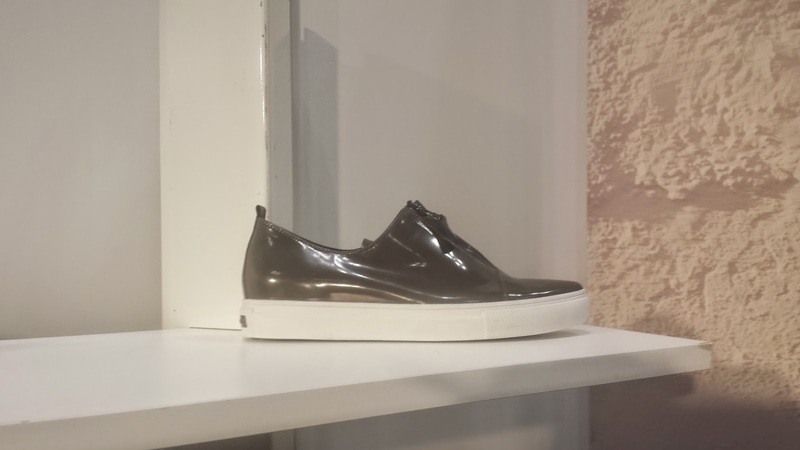 From Kennel & Schmenger Fall-Winter 2015: Pointy toe brush leather sneaker (left) in stone. At right, clockwise from left: black sneaker in leather with black crystals and overlay and ragged sole; square-toe, leopard-print bootie in calf leather, and white leather sneaker with leopard-print detail at heel collar. Photos by Yours Truly. THE German footwear company thrives in Asia and Europe, and for good reason. Kennel & Schmenger prides itself on craftsmanship. 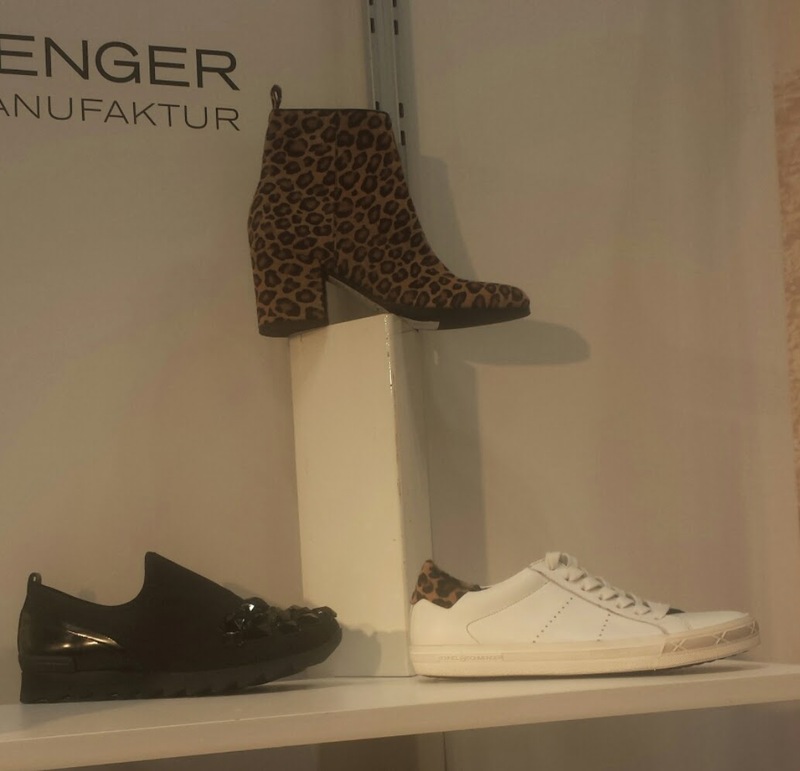 All of its shoes are handmade in Germany. Leather lining resides in each pair. This is not a brand that goes in for a lot of bells and whistles. It is not necessary; the shoes have a language of their own. Inexplicably, Kennel & Schmenger has been absent from the U.S. market for the last few years. However, it has returned to these borders in time to introduce Fall-Winter 2015, a collection that is more than 150-styles strong and accounting. It appears to be excited about re-upping on doing business in the New World. Black runner with Swarovski crystals. It is hoped that the reverse will prove true. 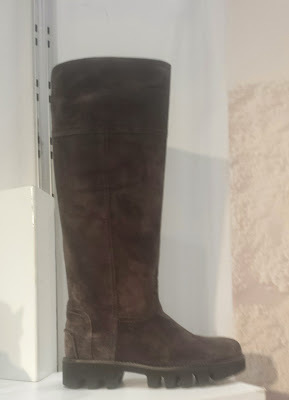 For it would be sad news indeed if a New Yorker or Arkansan has to travel to Belgium, for instance, to procure that burgundy bootie. It is leather but still bares calf fur. This is made possible though a special process that was explained to Yours Truly that fails the memory at the moment. In any case, just know that the leather is so very smooth – almost like cashmere. On the side is an elasticized panel that is called a Chelsea, another notable detail of the shoe, along with its ragged rubber sole. It simply would not do if one were compelled to journey to Hong Kong for the pleasure of a black sneaker categorized as a Runner. It is covered by Swarovski crystals. Kennel & Schmenger, according to the sales rep, is the only label in Europe permitted to apply the famous gems to shoes. 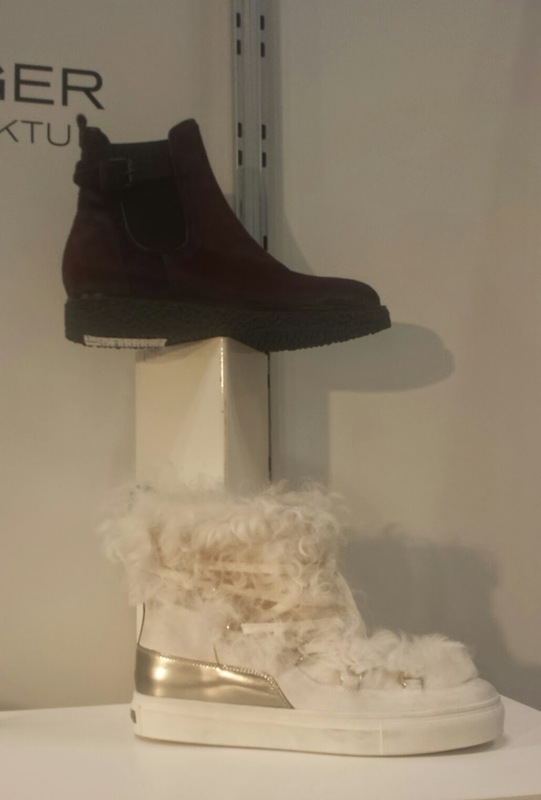 Burgundy bootie in calf hair leather and white leather sneaker with silver overlay at heel and lamb fur inside and out. Kennel & Schmenger for FW15, and the brand in general, has a quiet, strong presence. A case in point is the white-soled, stone-colored sneaker with a zipper on the vamp in a brush leather that bears a slight resemblance to patent. 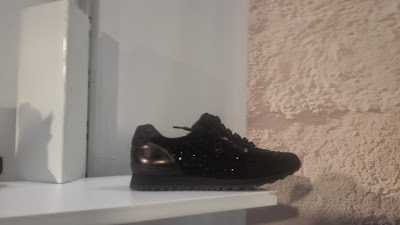 Like so many of the sneakers in the collection, it is uber-stylish and may wish to attend a gala. Further, on close and closer examination its sheer luxuriousness – as is the case for a number of other styles – is obvious. Yet it is never ostentatious, much like Kennel & Schmenger. Visit http://www.enkshows.com/ to learn more about ENK Coterie and all of the shows produced by ENK International; visit http://www.nicolasexton.co.uk to learn more about Nicola Sexton; visit http://www.kennel-schmenger.com to learn more about Kennel & Schmenger.